This stage size box is shown empty. The front door is closed and the top lid is opened, and pulled out of the box is a rabbit or stuffed animal! 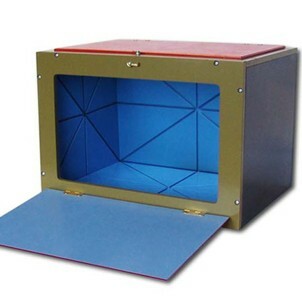 The box measures 13.7 x 9.38 x 9.75 inches (34.8 x 23.8 24.8 cm). The top lid opening is 11 x 6.75 inches (27.9 x 17 cm). The diagonal depth is 8+ inches.